Video surveillance technology provides the best leverage to improve public safety while staying within budget. While it is not feasible to put a deputy on every corner, video surveillance in effect puts a vigilant watch on every corner around the clock. The Hillsborough County Sheriff’s Office (HCSO) in Tampa, Florida had installed video cameras several years ago that were connected by a mesh-based communications infrastructure. Over time, as more (and higher HDTV resolution) cameras were added to the network, the system was unable to provide the performance required. 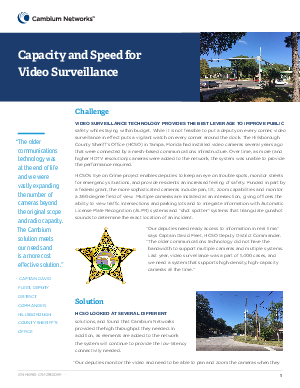 Download this case study to learn more about how HCSO improved their capacity and speed for video surveillance with Cambium Networks.